Your blog has been a favorite now since long before I stated to blog! The pie looks delicious and strawberry rhubarb is a favorite at our house. Evy's apron is darling as is yours. I found your mom to be talented just like her daughter with the post of the beautiful little doll/toy animal bed she/you redid for Evy's room. When I make pies with my grandchildren I also use the little cut outs I found in their plastic 'bakers kit' you can buy in the toy section. Also some stores sell round tubs of a large count of plastic cookie cutters and they usually have tiny cutters in those containers also. My little ones sprinkle cinnamon and sugar on the tiny cutouts of dough and then have litle cookies to eat. While the pies are baking. Thanks for your beautiful posts and sharing your beautiful home and family with us! You two girls look like you are having so much fun. Your pie turned out so well. I have never been a pie maker, but maybe I will try this recipe. Both of your aprons are so cute!! I just got the new Country Living, and was reading about that antique flea market. It does sound pretty great! The pie looks so yummy and I love yours and Evy's aprons! Love the farm chicks crisp recipe. I'll have to try their pie dough as I don't love mine. You might want to look for the little cookie cutters at williams sonoma or sur la table. You and your daughter are adorable! I really enjoy your blog, you have a lovely home. I have the issue of the magazine, I really enjoy all Country magazines. When I think of pies I think of my mother, she made the best apple pies ever! She wrote her recipe on the label from a Crisco can and gave it to me, I want to have that framed along with two very old recipes from my husband's aunt and mother for cookies and donuts. . .reading your blog reminded me to take them out so I do not keep forgetting. My mother's hand written recipe is now almost 35 years old! The other two could be older. Yummy! That looks delicious! I have looked at their recipe for crusts and have meant to try it. Will do now! I was at Sur la Table the other day and saw some tiny ones you could use for cutouts. I love your website! My girlfriend sent your blog to me last week. I grew up in Indiana. I am a home girl at heart. We love living out here, I also lived around the world so I have embraced alot of homekeeping via my travels and the rituals that I learned from other places. It's wonderful to have our first home after travelling and moving for 21 yrs! I am loving home and garden life more than ever! Love seeing all your creativity in every facet of your life. Right on! 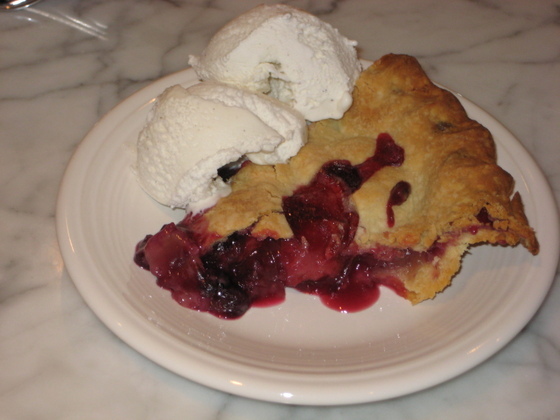 I was going to suggest possibly a Blueberry Peach pie. Another favorite ... Raspberry Peach. Not sure if you will be able to find Rhubarb right now. It was in season back in June. I've never used frozen but my mom has always said it's watery. But as I say, I'm not sure. Yum, that just looks way too good! I adore your little ones apron, she looks so cute! :) And Rathdrum is gorgeous!! I was a vendor at one of the last Vintage Barn shows, it was so much fun! A beautiful pie made by two beautiful ladies! I just finished my copy of Country Living and was admiring that article - how cool that it is your hometown! Such cute aprons! I'm glad you're back...I missed you! I use to see them made by Tupperware. My mother had one years ago. The pie looks so yummy, it made me hungry. Oh goodness - did you save me a piece? 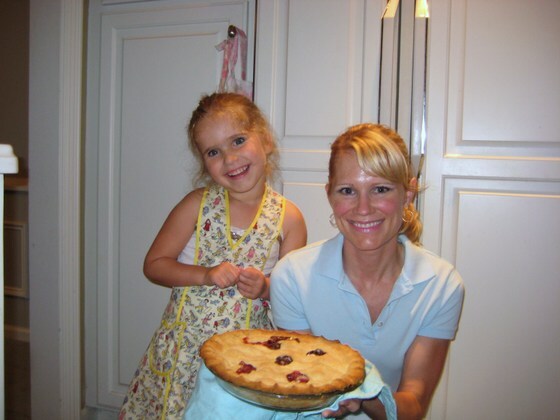 Your pie looks heavenly and I so love these sweet photos of you two girls! Beautiful! Looks real yummy. Hmmm...I better try it out one of these days, it will sure put some big smile on my son's face. That's some real good looking pie and so does both of you girls. I have been spending time catching up here, so glad you are back--we all need a break once in awhile! Your daughter is a gem, what a nice Mom to bake for her! What fun! Some of my fondest memories are of baking with my mom and grandma! That pie looks delicious. It looks like you and your daughter had a fun time making it. What a yummy, yummy looking pie. May I ask a question of you? What is the brand/color name of the green paint in your kitchen? The paint between the counter and the cupboard. It looks like a sage green. I really like it.